#7 DUKE 86, Washington (Huskies, 42,907 students, Seattle, WA) 80 -- Freshman Austin Rivers scored 18 points and the seventh-ranked Blue Devils overcame a 27 for 44 performance at the line to beat Washington. The Blue Devils (9-1) seemed in control, taking a 19-point lead three times in the second half. But the Huskies (4-4) shook off a terrible first half and started chipping away at the deficit. They were able get as close as six points late when Duke, which entered the game shooting 67.4 percent from the line, made just 12 of 18 free throws over the final 2:30, including a stretch where the Blue Devils made 1 of 2 on four consecutive trips. Arizona (Wildcats, 30,346 students, Tucson, AZ) 63, CLEMSON 47 -- After a sluggish start Saturday afternoon at Arizona's McKale Center, Clemson gave it everything it had in to pull within seven points late in the second half. However, the Tigers ran out of gas in the last four minutes as Arizona charged back with eight straight points to seal a victory in the 27th Annual Fiesta Bowl Classic. 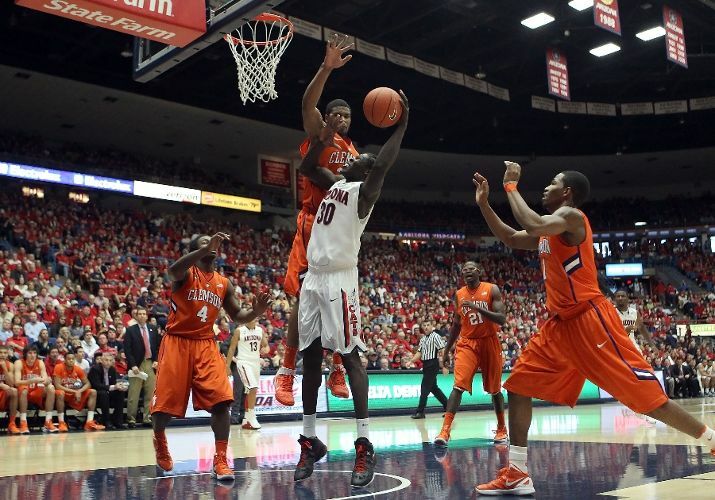 The Tigers fell to 4-4 with the loss, while Arizona improved its record to 7-3. GEORGIA TECH 65, Savannah State (Tigers, 4,552 students, Savannah, GA) 45 -- Georgia Tech center Daniel Miller dominated both offensively and defensively, scoring 12 points and blocking four shots as the Yellow Jackets defeated Savannah State 65-45. Brandon Reed added 16 points for Georgia Tech (6-4). The win is the Yellow Jackets' second straight, with both victories coming on the road against in-state opponents. Georgia Tech defeated rival Georgia 68-56 on Wednesday. The Yellow Jackets leveraged their size advantage inside to disrupt Savannah State's offense and force the Tigers (3-7) to become a jump-shooting team. Savannah State shot a season-low 28.3 percent from the floor (17 of 60) and went 4 of 20 from 3-point range. #6 NORTH CAROLINA 84, Long Beach State (49ers, 27,437 students, Long Beach, CA) 78 -- John Henson had 24 points and 10 rebounds, while Bullock added 15 points off the bench to spark the decisive spurt, helping the Tar Heels beat Long Beach State on Saturday night. Henson, a 6-foot-10 forward, has long been a defensive specialist who uses his long arms to pull down rebounds in traffic or swat away shots. But he made 12 of 17 shots for the Tar Heels (8-2), many on long jumpers. Meanwhile, Bullock scored eight in a row to help ignite a 13-2 run that gave North Carolina some breathing room against Casper Ware and the 49ers (4-5). West Virginia (Mountaineers, 29,306 students, Morgantown, WV) 77, MIAMI 66 -- Darryl "Truck" Bryant scored a career-high 27 points and West Virginia's defense put the clamps on Miami Saturday night. For the Mountaineers (6-2), it was their second straight victory in about 48 hours after upsetting Kansas State in double overtime Thursday night. Miami (5-4) lost for the fourth time in its last five contests. The Hurricanes started the season 4-0. Bryant, a senior, was 9 of 12 from the field and 5 of 7 from the 3-point line to eclipse his 24-point performance against the Wildcats. Seton Hall (Pirates, 5,245 students, South Orange, NC) 68, WAKE FOREST 54 -- Seton Hall used a 14-1 run midway through the first half and held Wake Forest at bay at the Prudential Center. Travis McKie led Wake Forest (6-4) with 17 points and seven rebounds. C.J. Harris joined him in double figures with 12 points. Harris has scored in doubles every game this season. Tony Chennault scored nine points and had two assists, while Carson Desrosiers finished with eight points.